Years ago, the process of capturing important memories on film often meant a time-consuming and expensive process. In addition to using heavy, awkward equipment, you had to then get the film developed at a facility, and then, most of the time, you had to splice everything together onto a larger reel for continuity. On top of all this, it was also a challenge to store all of the media, while keeping in mind the potential hazards such as moisture or heat can pose to your film. Having an old box of film in your attic is one of those “out of sight, out of mind” kind of situations, where people simply don’t think about it until it’s too late. Over the years, people have slowly begun to realize that their film is not going to last forever. Unbeknownst to countless people worldwide, their precious film is suffering from severe degradation at this very second, and before long will be destroyed without them ever knowing about it which is why it’s so important to preserve 8mm film before it’s too late. 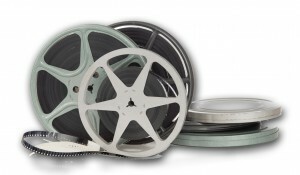 Even today, thousands of people across the country are still holding onto boxes and boxes of old reels that could benefit highly from a service such as an 8mm film to DVD transfer in San Diego. Transferring 8mm film to dvd or hard drive is currently the best way to preserve your film, and to stop the degradation dead in it’s tracks. Typically, film transfer services will capture each individual frame directly into the lens of a broadcast quality 3-CCD camera, and then specialized software will interpolate these individual frames into a movie and remove the flickering effect, in what’s called a “frame-by-frame” film transfer process. Frame-by-frame film transfer will provide you with the highest quality film to dvd in transfer in San Diego available, often looking much better than when shown on a projector. In addition to having a smooth, seamless capture, you can now perform color enhancements and restoration or editing with video editing software, if needed. When comparing film transfer companies, be sure to always ask about the method of transfer. There are still some companies who will project your film onto a white wall or screen and simply record the image with a camcorder. The quality of this method comes nowhere close the that of a telecine transfer descibed above. It’s often wise to have a specialized film transfer company handle the transfer of your old film. Quality telecine transfer units typically costs thousands of dollars, and for most consumers, it just isn’t worth the cost to transfer a couple thousand feet of film. However, if you do plan on transferring your film yourself, a cheaper alternative would be to project the film onto a high quality screen, and record it using a quality digital camcorder such as Digital8, MiniDV, or a Hard Drive camcorder. Just know that the results of this method simply do not compare to the quality of a frame-by-frame premium film transfer. Here at DVD Your Memories, we use a unique retrofitted projector with a built-in manually adjustable brightness controller to adjust over and under-exposed scenes in real-time, which can provide the highest quality film to dvd in San Diego. Next time you’re going through the old attic or closet, please keep note of the box of family memories on film in the corner, as it simply won’t be there forever! This entry was posted in Film Transfer, General and tagged 16mm to dvd, 8mm to dvd, film to dvd, Film Transfer. Bookmark the permalink. http://www.dvdyourmemories.com; You saved my day again.